We take pride in being able to offer our discerning pipe customers one of the largest selections of tobacco at any single location in the world. Over 450 different tinned tobaccos, and 150 bulk tobaccos await your sampling and approval. Our tinned selection includes tobaccos from A & C Peterson, Anthony Cranswick, Ashton, Astley's, Balkan Sasieni, Butera, Cornell & Diehl, Dan Tobacco, Davidoff, Dunhill, E. Hoffman Company, Erinmore, Esoterica, Former, Fribourg & Treyer, Gawith Hoggarth & Co., Germain, G. L. Pease, James J. Fox, Larsen, Mac Baren, McClelland, McConnell, Orlik, Peterson, Planta, Presbyterian, Rattray's, Reiner, Robert Lewis, Rotary, Samuel Gawith, Sillem's, Solani, Stanwell, and Wessex. 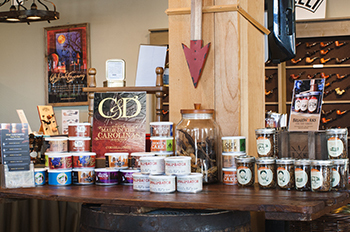 Also available are the Low Country Pipe tinned tobacco selections, blends that have been hailed by magazine reviewers and pipe smokers throughout the country. Can't stop by our store? Click HERE to shop online.